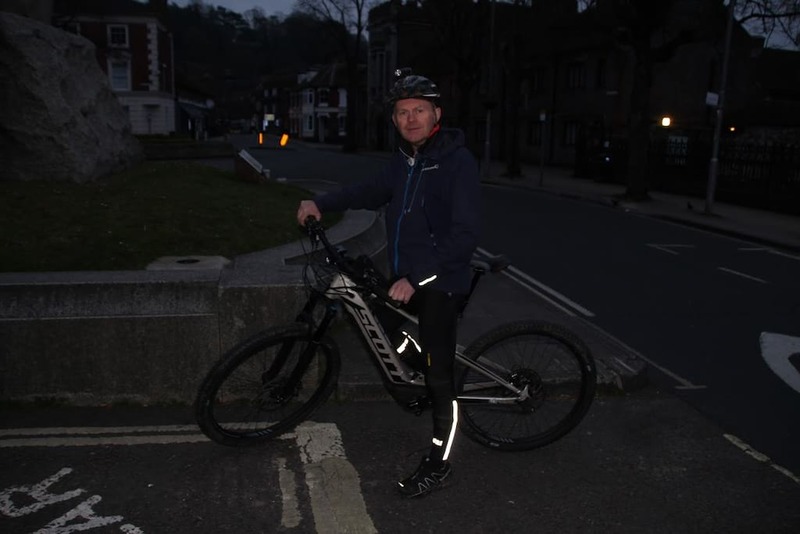 Over on our forum one of our readers, Rob, said they were planning to do the South Downs Way: ‘I’m going to see if I can be the first to get an e-bike from Winchester to Eastbourne on one charge inside 12 hours.’. 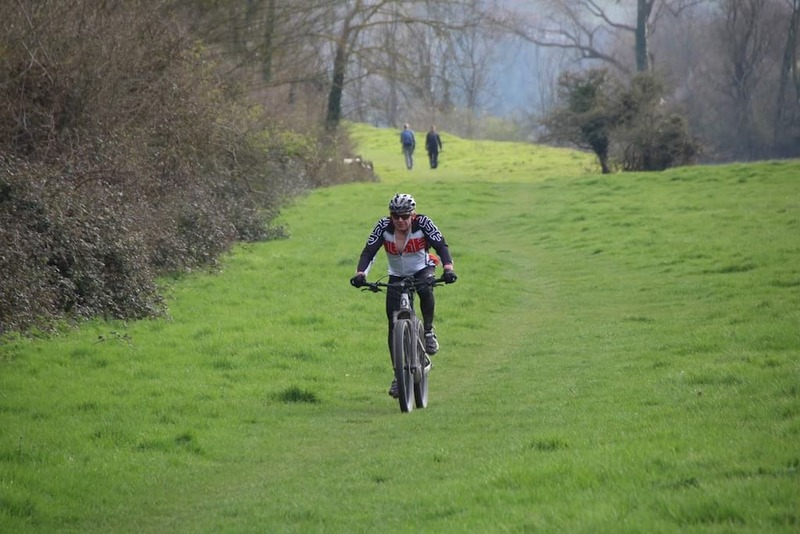 The responses varied between ‘Why would you want to do that?’, ‘Go for it!’, lengthy arguments about whether pedalling harder actually helped save battery life, and further lengthy arguments about the definition of ‘fun’. Rob ignored the debate and got on with the ride. Here’s his report. Went to the pub with a buddy, drank beer, came up with something dumb to do…. Got the Scott eSpark back in November and spent time learning how to get the most out of the battery. Many riders get limited miles out of a charge as they race full-tilt up the hills, I learnt how to become more efficient. 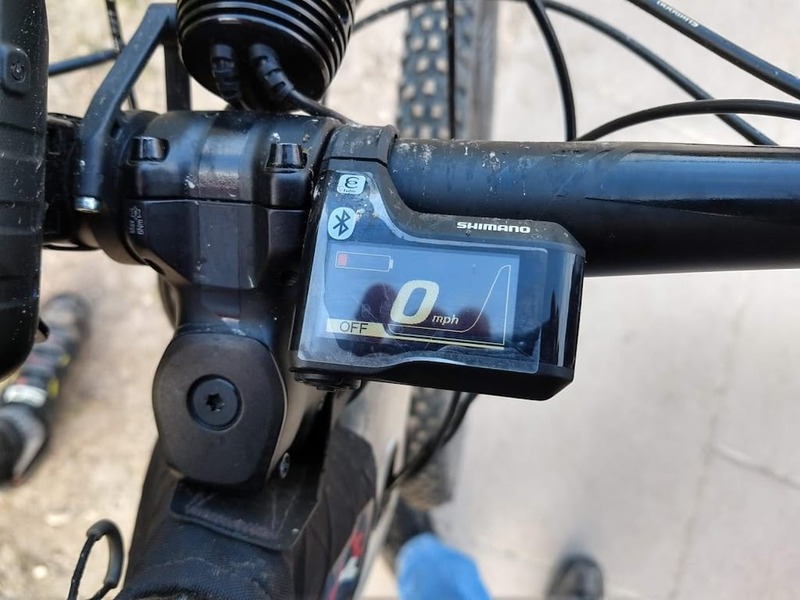 By watching the screen display on the handlebars that shows how much you are using at any moment of a climb and by going a few mph slower, the drain on the battery is so much less. There has been loads of discussion regarding cadence and gear selection, but it’s all there in front of you (people spend all day looking at a phone screen, I wonder how much info they are really taking in if they can’t see this for themselves?). I left the bike pretty much factory except for the tyres (changed to Schwalbe Rocket Rons) for all of my training and then swapped out the saddle for the event as I knew my Prologo would suit me for a full day ride. We debated about changing handlebars, fitting smaller brakes, getting rid of the dropper to save some weight but elected to keep the standard equipment to make it a realistic test of what a normal ebike can achieve. We also planned to power all the lights from the onboard battery and Exposure Lights came up with an up to 3000 lumen light with a prototype of their new Flex e-bike specific light for the ride so that made night riding and winter training easy. Lights: Exposure came up with a prototype of their new Flex ebike specific light that runs off the bike battery that can kick out up to 3000 lumens! It really did make winter training feel like I had a lighthouse on the bars! Food: I tend to concentrate on protein. Meryl mixed half a cup of protein powder that I necked as soon as I was stationary, and I let the carbs look after themselves – I had a chewy bar of some sort – wafers, Double Decker, Twix, oaty crisp bars (other types of chocolate are available) shoved in the top-tube bag at each aid station and a mouthful of banana or a tortilla cheese and marmite wrap as I rode out of the stops. I have a way of approaching endurance events by just labeling them as picnics, so this was a 100 mile picnic as I try to eat something every 20 minutes from the get-go so I never get the feeling of not wanting to eat later on in a ride. I once did a six day race down the Yukon where we were racing for 18 hours a day and we had watches set to beep every 20 mins to remind us to put food in. We were so far behind the leaders by day three because of this plan, but we won in the end as the other teams slowed down cos of dietary issues and we just kept eating (that was a 1000 mile picnic). On board: one tube, small pump, tubeless repair stuff, one satellite tracker. I don’t have a mobile phone so I don’t get distracted. Other Kit: I went through a phase of companies sponsoring/ helping me but it generally entails a blog and lots of stopping to take piccies so these days I tend to purchase most of what I want. Though I do really like the Mavic Ksyrium Pro bib shorts and the Exposure windproof fronted top that I wore for this ride – it is my go-to combi for spring and autumn but in the winter I’m in boots with heated insoles and ski gloves. There was a fair sized bag of clothing that was in the support car and more than enough pre-mixed High 5 4:1 that I use when I have support – I use this at half the strength that the makers suggest as any stronger makes me not want to drink it after a few bottles as it can be too sticky. I made a plan as to where I would use the battery on particular hills and where I would shove it in walk mode (there were only a few places I planned to use the walk option: up cattle-grid hill at Harting for one and just after Devil’s Dyke at Saddlescombe for another). It was superb to be able to clear Mercury in eco mode and a bit of a bonus mentally cos I was still cheesed-off about losing time from the puncture and that was one of the planned ‘walk mode’ hills, along with the two woodland climbs at the Lewes A27. I also flew up Amberley Mount for only the second time (the other time was with a 30 mph tailwind a few winters ago when out on the Tallboy. There is no point in fiddling with engaging the assist on little hills but it is fun to flick to it on on ones such as Chanctonbury and the Truleigh YHA and clean it at a decent pace! Towards the latter part of the trail I was also using the battery to accelerate away from gates as my legs were getting slow, just to get up to riding speed again. 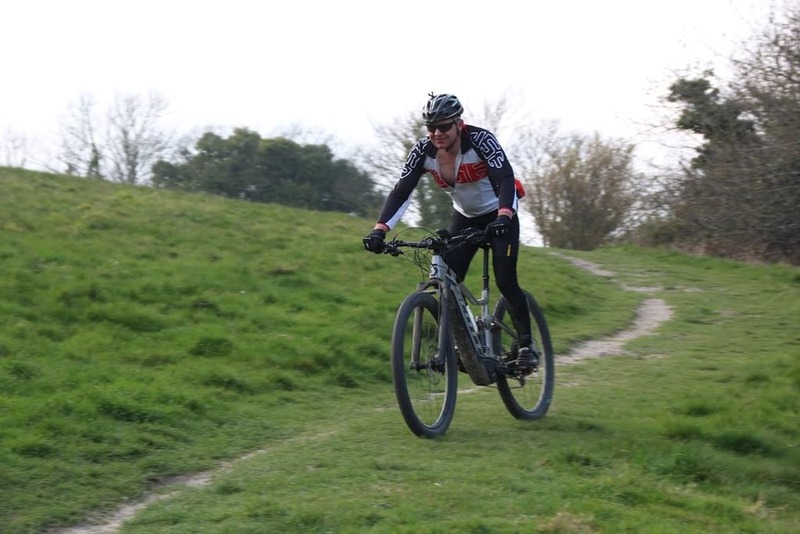 I dropped the bike once, at a gate in Alfriston where it’s rooty and my concentration was on the wane but it was fine even though it was derailleur side down when it landed. The day was too cold (I run cold) to get into shorts at all so the legwarmers and jacket stayed on all day and I only got out of winter boots at Cocking. 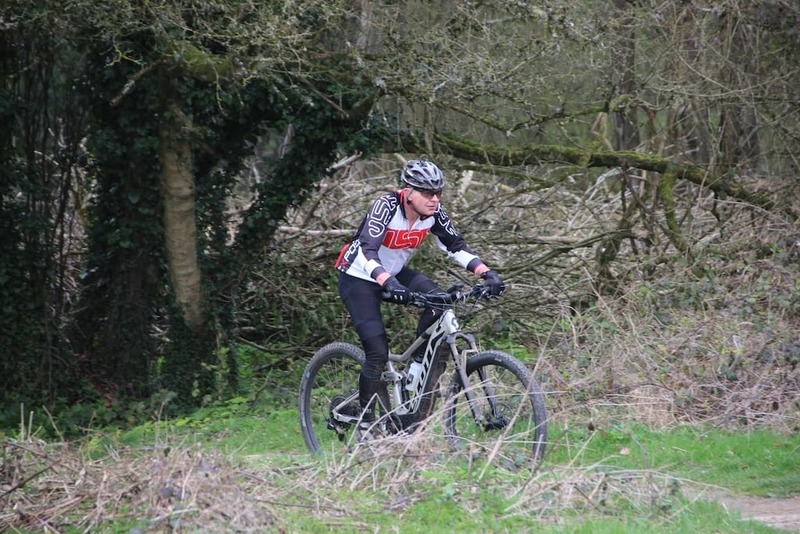 From there on I didn’t change layers at all so each pit-stop was fast – Meryl had a half a cup of chocolate protein drink mixed up for me and Andy changed out the 500ml High 5 bottle on the frame and re-stocked the top tube bag with another chewy bar. I had a mouthfull of banana, tortilla wrap or some snack in my mouth as I rode out of every pitstop – the pics make me look like a ravishing hamster. 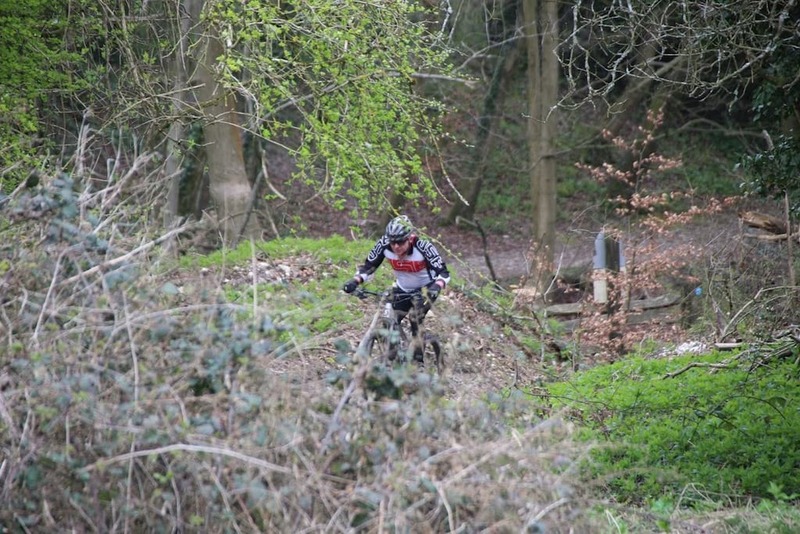 Out of the 90 gates on the route, I had one opened and closed for me by a walker and one closed behind me too – not as good as a weekend ride on the SDW but there were fewer pedestrians to dodge, so a win for a midweek ride I think. 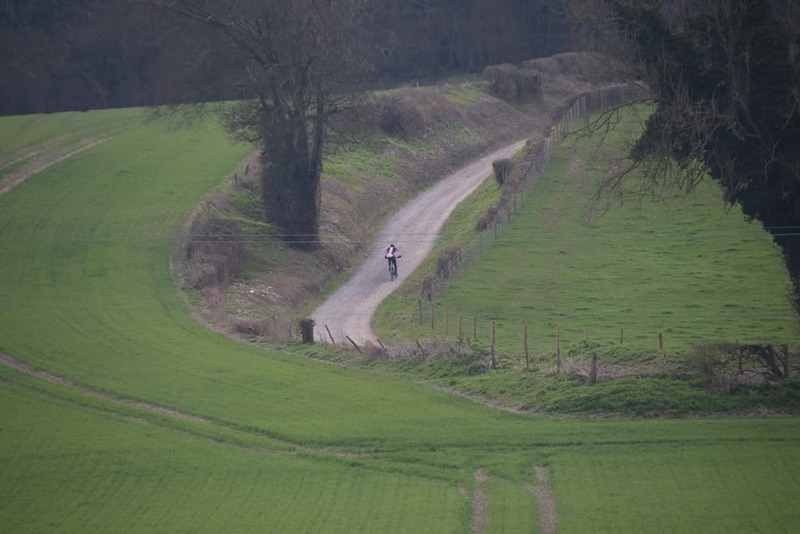 I think I’ve done a 10.5 hour unsupported SDW a few years back so this looks like it was up there with one of my best, but it’s so difficult to compare rides as the support crew mean you can carry less weight but have to stop more often to resupply. I did an 11.5 hour for my first leg of the SDW Double Double but again, that was on a stripped bike with a great support crew. We can feel that grass sapping the speed. The bike was great fun to ride and train on through the dark winter nights and much better than sessions on the turbo trainer, though I don’t expect it will really catch on as a long distance machine. You really need to pay attention to finding the fast patches to ride on and not get carried away with all that power! 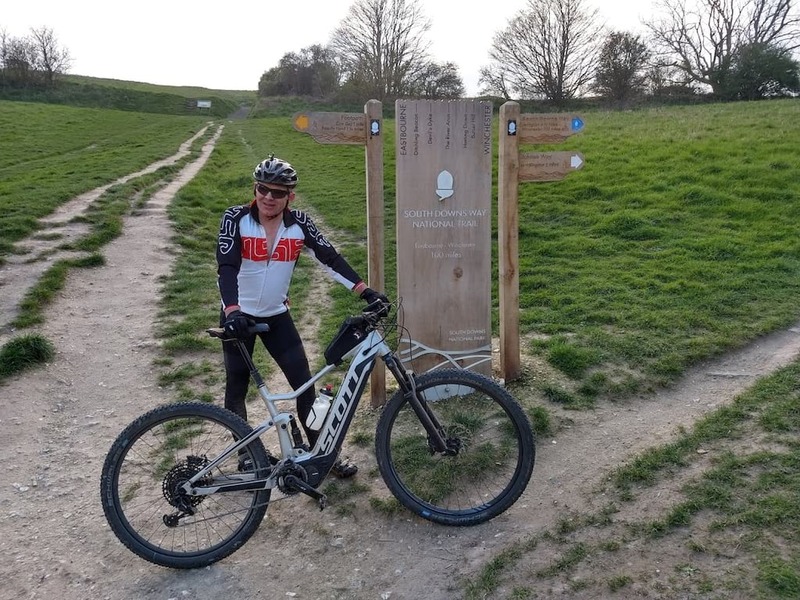 I would love the thank the members of the South Downs Mountain Bike Club – they used to laugh at me when I came up with daft ideas (when I first joined them it was to learn to ride a bike as I was entered into the Trans Rockies later that year). They are a great bunch and nowadays they just roll their eyes and ask whats next? We have another club member doing a 2020 Tour Divide so I’m happy some of my dumb ideas are catching on. Rob looks happy though. (which is all that matters really). Also commendable for not getting sucked in by the stupidity of the forum comments. Very well done. This gives me hope for my own 100 mile ebike trip, though that’ll be a different beast since I have double the battery capacity, far flatter terrain and plenty of opportunities to charge. It won’t be super easy though since I’m heavier, less fit and looking to maintain 12-13mph.